Barboro Butchers on Preston’s Dave Barboro. A COMO butcher is feeling a bit regal after claiming a prestigious crown for the first time. 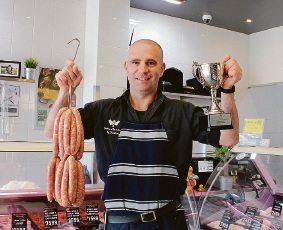 Barboro Butchers on Preston won the continental category at the WA Sausage King awards. Owner Dave Barboro said that after coming close to winning prizes at the awards in previous years, it was a good feeling to claim the honour. “We’ve had a few places in the past years, including a second place for our gourmet lamb sausages, but we’ve never won at the awards before,” he said. “To win is a great achievement, we’ve had the recipe for a long time but we’ve made some subtle changes. Mr Barboro said his employees took a lot of pride in the prize. “We do a little bit of experimentation with the sausages, we use the same base ingredients but then fine tune it,” he said. The WA Sausage King awards were a part of the 2016 AMIC WA Annual Awards Dinner, which was held at the Bentley Pines Restaurant at Polytechnic West on September 13.